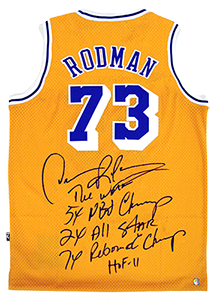 Dennis Rodman has developed from a janitor who had never played organized basketball into arguably the best rebounding forward in NBA history and one of the most recognized athletes in the world. Enigmatic and individualistic, Rodman has caught the public eye for his ever-changing hair color, tattoos and unorthodox lifestyle. 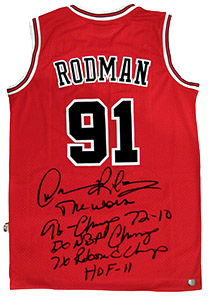 Rodman’s achievements on the court are indisputable. A two-time NBA Defensive Player of the Year and a member of two championship Pistons teams in Detroit and three title-winning Bulls teams in Chicago, he has led the league in rebounding for seven consecutive years despite standing only 6-8 Wilt Chamberlain is the only player to win more rebounding titles, 11. 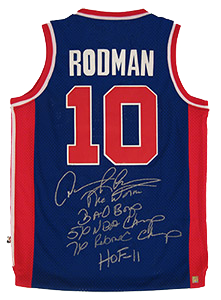 Rodman is one of the few players in basketball who can change the course of a game without taking a shot. 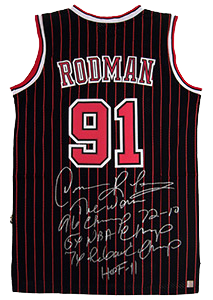 This piece comes authenticated by Authentic Signings, Inc. and comes with a photo of Rodman signing the piece. 3 tamper resistant are holograms affixed to each item.